Children have been the target of Satan for centuries. When a new king took power in Egypt, he was threatened by the number of Israelites that were living there. He feared that when they grew older, they would join with his enemies, so he ordered that male children be killed when they were born. His reason for wanting these children killed was fear. Often we are told in the Scriptures to fear not, or do not worry. These are the schemes that Satan uses to justify irrational actions. Since January 22, 1973 there have been more than 50 million children killed in the United States by abortion. In China, forced abortion is the law of the land, where Chinese officials fear large populations, so couples are only allowed to have just one child. There, girls are either abandoned or killed at birth, usually by drowning (infanticide). They prefer boys over girls so that the family name may continue. While the new king of Egypt had his reasons (war) for wanting all of the boys killed at birth, the Chinese have different reasons (population control) for wanting to kill all the girls. These different reasons are both driven by fear. Killing children has been a worldwide pastime for centuries, yet few people notice or even care that even now it goes on in front of our very noses and on a daily basis. What is amazing is that Christians tolerate the practice and even support it by electing pro-abortion candidates for public office, calling abortion a right. The “right to choose” far out-ways the child’s right to exist, even among most Christians. As you can see from the previous Scriptures, not much has changed since that new king took control of Egypt. We will look at more Scriptures, reviewing past atrocities against children, giving further evidence that what took place then, continues even today. Christians should take heed because God didn’t suddenly have a change of heart. What was unacceptable to Him back then has not changed. Coming up, we’ll also see how God dealt with those that murdered, abused, slaughtered, and even condoned these actions against children. 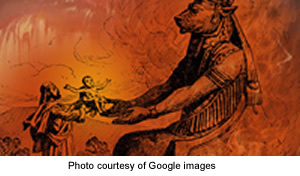 Molech was an ancient fire deity, of a common type worshipped throughout Canaan generally, and Phoenicia particularly. Under various names, depending upon the city or country, Molech is essentially identical with Chemosh of Moab, and probably Melqart of Tyre. The general name for this type of fire god used throughout Palestine was Baal, meaning ‘lord.’ Molech was the national deity of the country of Ammon, east of the Jordan, or the Ammonites. Molech was also worshipped by the Israelites on many occasions, much to the distress of the prophets. According to Jewish tradition, the cult idol of Molech was made of brass, hollow, and with hands so positioned that something laid therein would fall to the fire below. The practice of laying a child across the hands, and thus committing them to the fire, was termed ‘pass through the fire to Molech’ (emphasis mine). Children were once sacrificed to the god Molech by being burned. Whether they were burned alive or not is not known and is irrelevant. In our more civilized world, aborted children are often burned in hospital incinerators. Although they are not burned as sacrificial offerings, they are killed simply for convenience, which may also be called a god. God did not tolerate His children being sacrificed to the detestable god of the Ammonites, Molech. Those that would do such a thing were to be stoned to death. But His punishment didn’t stop there. If the community looked the other way knowing that this practice was taking place, God would turn away from them and their families, and they would be cut off from His people. In our very own communities, abortion is taking place on a daily basis. We know it is happening. Some of us speak out against it, while others speak out for it, again, calling it a mother’s right to choose. And then there are those that just look the other way. They don’t necessarily agree with the practice, but because it doesn’t affect them, they look the other way as if they will not be held accountable for allowing the practice to continue. If God was angry with the Israelites for sacrificing their children to a pagan god, will He not also be angry with those that are called by His name (Christian) that sacrifice their children for the sake of convenience? Will He not also be angry with those that look the other way since they could have done something about it! God can be provoked to anger and His wrath cannot be very far off. See what God allowed to happen in those days. He did not cause them to happen, He merely told them what was about to happen. If He withheld His protection from them in those days, should He not do the same for us today? Here we see people that claim to worship God while they sacrifice their children to strange gods. But God says, that even if they think they worship Him, they really do not. Vengeance was the reason for murder in Athaliah’s heart. Even the life of an innocent child was meaningless to her. Jealousy was the motive behind killing all of the Jews, including little children. Mordecai, who was a Jew would not bow down to worship Hamen, so Hamen’s solution was to kill all the Jews since they would be unwilling to bow down to anyone but the true God. How long will God be willing to wait for this generation to wake up! How long will God’s people stand by and do nothing, looking away as though nothing was wrong, but knowing in their hearts that children are being slaughtered every day by the thousands all around us? Should God not be angry with His people today? As He handed His people over to their enemies in the past, what makes us think He will not do the same to us now? Is there no fear of the Lord? Has He withheld His wrath for so long that we have forgotten His great and mighty power? Satan has been trying to destroy God’s people since he was thrown out of heaven. Even Jesus was threatened as an infant by a jealous ruler called, Herod. The lives of innocent children meant nothing to Herod. This king was jealous and became worried that a new King would arise. His reason was one of selfishness. These are not Christian traits, but traits of those that are controlled by Satan. This Child that Satan had hoped to devour was Jesus. Satan is the cause of all murders beginning when Cain killed his brother Abel. He plants these seeds of fear, worry, jealousy, vengeance, and selfishness to the detriment of innocent little children. Is it any wonder that children continue to be murdered by the thousands each day? But you Christian, what is your excuse? Why have you not done more to confront this evil that has been allowed to persist in our communities? What excuse will you give to Christ on that day when you will meet Him face to face? How can He say to you, “Well done good and faithful servant”, when you looked the other way. Non Christians at least have an excuse. They have no knowledge of the truth, and will do things consistent with their sin nature. So I believe it will be worse for you that know better. Christians have certain responsibilities that must be carried out. One of those responsibilities is to defend the helpless. Psalm 10:1-11 could be a picture of the abortionist. So how should righteous men respond? Why should the righteous defend those that cannot defend themselves? And if the righteous fail to act? Could the following words apply to us today? There is no question that God has prospered America. We are the most prosperous nation on earth, even in these tough times. Not only are we prosperous, but we are powerful. In our brief history as a nation, no one has been able to occupy, take over, or control us. We are a sovereign nation and need no outside influence to exist peacefully in a world racked with wars and rumors of wars, although there have been attempts in the past. And most recently, fanatical Muslim extremists have declared war on us by attacking us in our own land. No matter how you feel about the war with Iraq, no one can deny that Islamic terrorists are attempting to take control of the world by force, even our own country. Could this be a wake-up call for those that are called by God’s name? Is He beginning to deal with us over the issues of abortion, adultery, homosexuality, and idolatry? If so, it is not the fault of non-Christians. The fault lies within the Church of Jesus Christ. The abortion rate in the Church is no different from the abortion rate outside of the Church. The same can be said for divorce and adultery. Many Christians are more loyal to their priest, pastor, preacher, etc., than they are to Christ. This is called idolatry. This is a form of idol worship. And we are now seeing more and more openly gay churches and ministers of these churches calling God a liar by excusing their sin of homosexuality and calling it good rather than confessing it as sin. After September 11th, 2001, many people of different faiths and denominations came together to pray. Stadiums were filled with these people, praying together to the god of their choice. Jews, Muslims, and many Christian denominations, including Roman Catholics, prayed side-by-side, hoping that God will hear them. But consider what He says about those that are called by His name. Who are God’s people that are called by His name? Christians! We have taken the name of Christ. We make no apologies and profess that we are His followers. In times past, God caused His people great suffering in order to teach them a lesson. And then He told them what they had to do in order for Him to hear their prayers, forgive them, and heal their land. There is a formula. First He says to humble your-self. Then He says to pray and seek His face. And finally He says to turn from your wicked ways. When the Church is capable of doing these things corporately, God will not cause disaster to strike His people, and He will be willing to hear us, forgive us, and then heal us. Are we waiting for disaster to strike us again before we adhere to God’s formula? I’m not implying that God caused the events of September 11th, 2001, but could He have allowed them to take place? Certainly, He could have prevented it. If we Christians fail to humble ourselves, pray and seek God’s face and turn from our wicked ways, we should expect to receive our due punishment as God pours out His wrath on His people. Human life is precious. God knew each one of us by name even before we were in the womb. Children are an inheritance from God; even a reward. Yet, they are used as pawns, even by people that know better. Christians should begin defending children in the womb, even at the embryonic stage (which is just another, yet early stage of development leading to adulthood). There are legal means that can and should be employed to halt the destruction of so many children. Satan has enjoyed his bloody party far too long while we look the other way. God is watching! If we don’t act appropriately soon, we cannot expect Him to withhold His anger. If we continue to ignore the suffering of the innocent, might we be made to suffer the wrath of God? Electing appropriate government officials are our responsibility. There are enough Christians to topple every immoral, anti-Christian, anti-woman, anti-child, anti-family politician in this country. Those politicians that espouse values that are contrary to Christian values should be removed from office and replaced with those that will further the cause of Christ rather than bury His cause under an avalanche of secular humanism. Given the opportunity, the heart of every Christian should be about the business of defeating Satan’s control over human affairs. If he can destroy our children before they are born, he will have won many battles. Since January 22, 1973, he has destroyed more than 50 million of them. It’s time to turn this trend around.